Days like today – Where in the world is Kelly? Days like today make me mourn the shortness of my time remaining in Indonesia. Days like today make me wish I was in it for the long haul, wish that I had time to nurture the relationships that are just now starting to bud. Days like today make me already feel the regret of leaving just when those buds start to bloom three months from now. But the time for leaving will be here in due course. For now, it is enough simply to enjoy days like today. 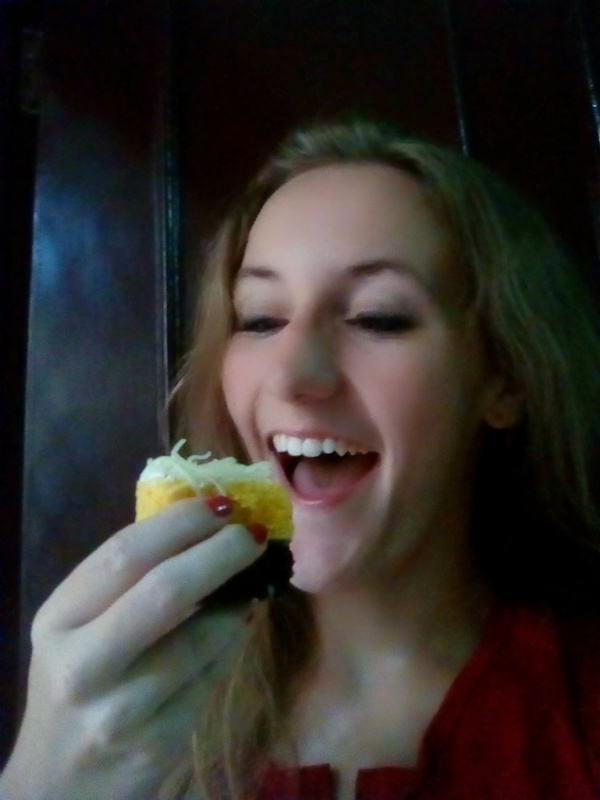 Days like today: having my cake and eating it too. Today started simply. I finished reading First Darling of the Morning: Selected Memories of an Indian Childhood by Thrity Umrigar, on loan from Krupa’s bookshelf. I drank two cups of coffee and puttered around at home, getting some monthly assignments done while the voices of the ’60s and ’70s (Bob Dylan, Joan Baez, Janis Joplin) filled my house. I took frequent breaks to dance for the ants, my constant audience. I nibbled at the cake a teacher from school thoughtfully brought me yesterday. (He showed up at my door with cake in hand less than ten minutes after I told him I didn’t eat breakfast because I don’t have food at my house.) I allowed my hands to constantly become distracted with texting friends near and far. In the early afternoon, I summoned an Uber and went to Universitas Airlangga, my “adopted” campus and home of Surabaya’s American Corner. The driver and I made pleasant small talk. I have begun lying about my nationality, claiming to be Canadian, so that the drivers’ questions stick to benign topics like snow and other Canadians. I am avoiding the “T” word whenever possible, especially with strangers, lest it cast a cloud over even the sunniest of days. While I always go to Airlangga to attend events at American Corner, today was a special occasion. There was a two-day festival called Japanese World, and indeed the entire festival was centered around Japanese culture. For a glorious afternoon, there were plenty of people who were far more interesting to look at and talk about than the one bule in attendance. I originally heard about this event from one of Krupa’s students who competed in her WORDS Competition on Friday. Lusy, a fellow judge at Krupa’s WORDS and a friend from American Corner, agreed to go with me. So we set a date: Sunday afternoon we would watch the cosplay competition. Left to right: Zahra, me, Lusy. Lusy invited Zahra, another friend from American Corner, and together the three of us had a perfectly lovely afternoon. We walked around the booths, sampled some of the food on offer, commiserated over the heat of the outdoor event, and watched various cosplay performances. Through it all, we talked. And talked. And talked. 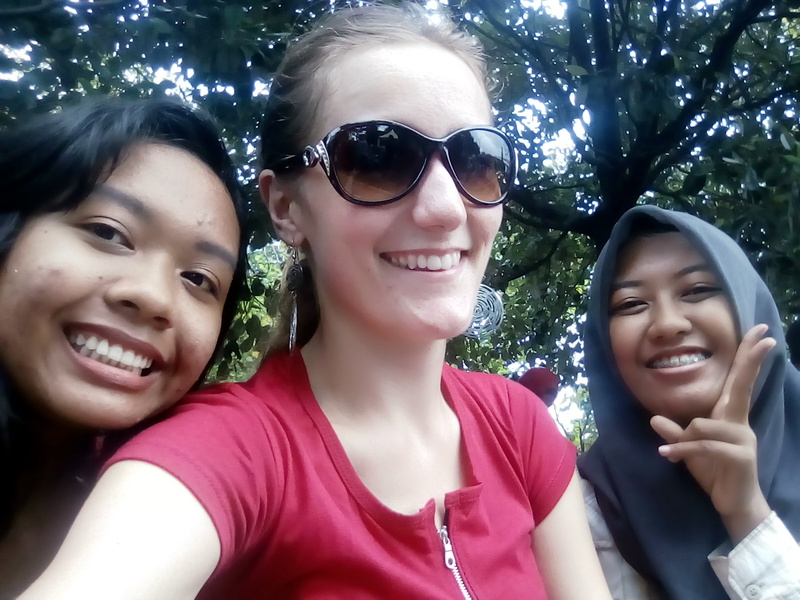 They speak phenomenal English, so we conversed in English with the occasional word in bahasa Indonesia sprinkled in. I felt as if we could have been on a college campus anywhere in the world. It was a relief–a true breath of fresh air–to be with these intelligent, worldly, young Indonesian people. Not that I don’t meet intelligent, young Indonesian people all the time; I am, after all, a high school teacher. It’s just… sometimes it can be tiring to constantly deal with the less-than-worldly masses that make up the majority of my daily interactions. The stares and shouts and pointing and laughing and worse that comes from these people is draining, to say the least. But days like today make up for all the other days where I feel less than charitable toward everyone I meet on the street, even those who have done me no wrong. Days like today make me wish that I could stay longer, become closer with this wonderful community of students, see them graduate and make their own way in the world. Days like today give me hope for the future of Indonesia, with capable young people like Lusy and Zahra at the helm. I have only three months left in Indonesia, and days like today are a necessary reminder to make every remaining day count. After all, I don’t know what’s in store for my future. I only know that the most I can ask for now is to have as many more days like today as possible before I leave Indonesia. Who knows when I’ll be back? Thank you for sharing your joy of the day with those of us who are fortunate enough to read your blog. It was uplifting to see you happily enjoying your time in Indonesia. There is always good and bad with every circumstance. It’s scary not knowing what the future holds, but it’s all part of the adventure filled with surprises around each corner. I for one look forward to having you back in my little corner of the world – I miss you! Nice post Miss Kelly. May you have many more days like this, eh. Sounds like a lovely day Kelly. One of many more to come no doubt. I find it sad but understandable that you claim another country as your home.